GDR Photomed · 2010, Thienot E. et al. 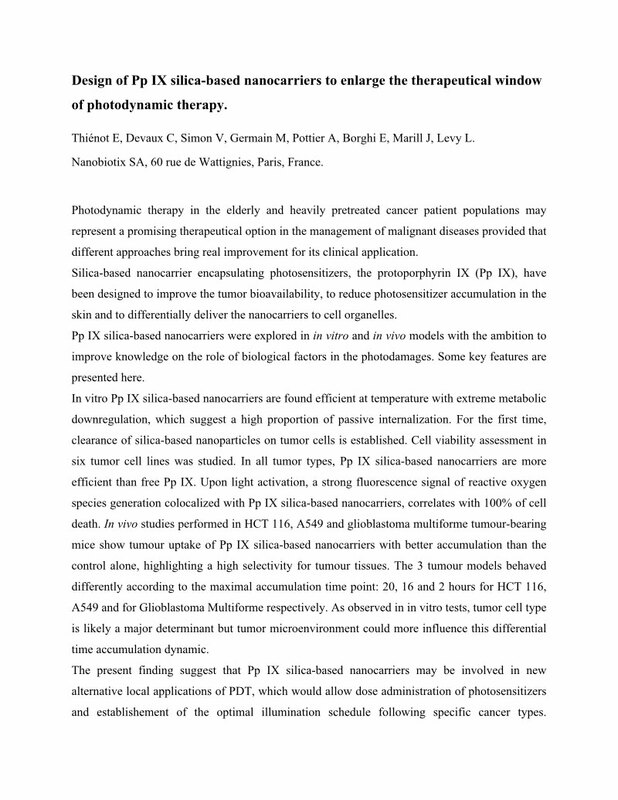 Nano Publications > Congress Abstracts > Miscellaneous > 2010 – GDR Photomed Abstract – Silica Nanoparticles for Photodynamic Therapy – Thienot et al. Thiénot E., Devaux C., Simon V., Germain M., Pottier A., Borghi E., Marill J., Levy L.
Photodynamic therapy in the elderly and heavily pretreated cancer patient populations may represent a promising therapeutical option in the management of malignant diseases provided that different approaches bring real improvement for its clinical application. Silica-based nanocarrier encapsulating photosensitizers, the protoporphyrin IX (Pp IX), have been designed to improve the tumor bioavailability, to reduce photosensitizer accumulation in the skin and to differentially deliver the nanocarriers to cell organelles. Pp IX silica-based nanocarriers were explored in in vitro and in vivo models with the ambition to improve knowledge on the role of biological factors in the photodamages. Some key features are presented here.